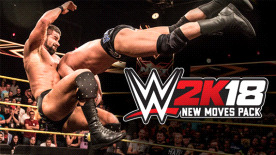 Add an assortment of brand-new moves to your arsenal with the WWE 2K18 New Moves Pack! Dominate your opponents with moves like the Tye-Breaker, Crash Landing, Pumphandle Death Valley Driver, and the Swinging Sleeper Slam! Please note: Requires WWE 2K18 (base game) to use this DLC.